REVENGE IN THE BIG APPLE! Having destroyed the evil Neo Zeed empire, Shinobi (Joe Musashi) was not heard from again. Joe Musashi could now relax as his ninja skills and techniques were not needed. However, one day a school seemed to have been attacked and children were held as hostages. Kato, Joe's former martial arts student, when to investigate and try to help but was almost killed by the ones that over took the school: The Union Lizard. Joe went to the hospital Kato had been put in, but Kato died before Joe arrived. All that Kato left was his faithful dog, called Yamamoto. Joe swore revenge to Kato's mother and left with Yamamoto to destroy the Union Lizard, which had now taken over almost all of New York and taken many hostages. Shinobi's mission was to rescue them all and destroy Union Lizard. --From the Genesis Shadow Dancer: The Secret of Shinobi instruction manual. Play Shadow Dancer: The Secret of Shinobi Now! A new game and a new quest for our hero, Musashi. Originally released as an arcade sequel to Shinobi, it was greeted with little success, as the original seemes to have done much better. 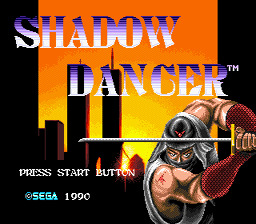 However, this console release was not a direct port of the arcade Shadow Dancer. With new and improved story and level design, the Genesis version was a far superior game.